Activation of middle trapezius (MT) and lower trapezius (LT) is delayed, and their activities are decreased. Serratus anterior decreases in strength. Upper trapezius (UT) experiences early activation and over-activity. Patient’s condition must be considered first before creating a rehabilitation program to treat shoulder problems. This will help in determining whether an open chain or closed-chain movement can be applied. The problem with some traditional exercises for the scapula is that they are usually performed on the floor instead of using other equipment. In order to apply a much better program to rehab the scapula in Pilates, functional positions must be determined properly. Therefore, therapeutic Pilates must be designed based on function. In many exercises for shoulder, patients are usually advised that their shoulder blades should be positioned back and down because their upper traps are overactive. This is actually a mistake. There is no problem with it so long as they do not have to elevate their hands beyond 40 degrees. The problem is that they are probably unaware that upward rotation of scapula is an important part of elevation of the shoulder. The role of upward rotation helps a lot improving that function of the scapula. When upward rotation is applied, it reduces the stress on shoulders. It also flexes the muscles around scapula thereby strengthening the outer support. Moreover, it spreads the force evenly so that each part around scapula will not be overactive. The main benefit of this is to gradually adjust the shoulder movements to other directions. Doing an upward rotation regularly will rehab the scapula. Low row, on the other hand, is a good therapeutic Pilates that treats problems in areas such as scapula posterior tilt, shoulder external rotation, LT and SA activity. Kneeling on the reformer, standing, and prone lying is the positions that you can apply to retrain low row. For those with symptoms of UT over activity, these positions are recommended to help them treat such symptoms since they are also proven to stimulate LT activity. The good thing about low row is you can manipulate your own weight, and adjust the movement in a particular position. You can repeat the procedure depending on your condition. To rehab the scapula in Pilates through low row does not require a bench as you will have to perform movements such as lying, standing, and kneeling. The significance of this method depends on the said movements and not on equipment. However, it is a bit strenuous, so you have to prepare your body before doing this. Nonetheless, low row is very effective. This method has treated a lot of people with the scapular problem. This is not the robbery as many people think of. 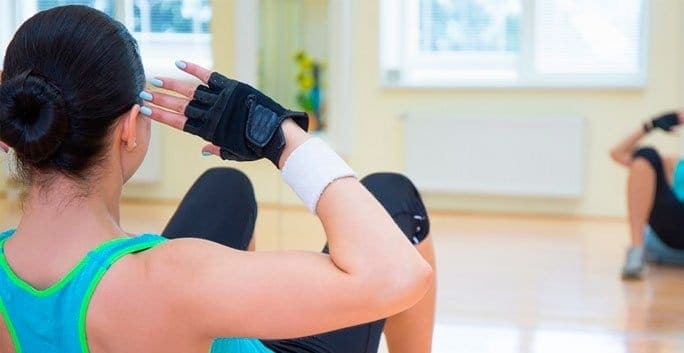 However, robbers would ask you to put your hands up, and this is the position that you can use in this type of rehabilitation program for shoulder problems. In doing the robbery exercise, all you have to do is to put your hands up while pulling the rope. If you want to distribute the force from your lower arms to your upper arms, you can put the rope around your elbow. Put your hands down while holding the rope and pull it again by putting your hands up. You can repeat this movement as often as you can. If you perform this more often, it will strengthen your serratus anterior and scapula. LA and SA activity will also improve through robbery exercise. If you don’t prefer using rope, you may also use light dumbbells or adjust their weight. Just make sure your hands are in a position as though you are knocking a door. The faster you put your hands down and up will give you better results. Push up is the most popular exercise that many people do. This is also very popular in military training. The reason for this is that it targets many parts of our body. It promotes muscular development around chess, upper back portion, and upper arms. Furthermore, it improves heart rate and blood circulation. Aside from developing muscles and improving blood circulation, pushups can also be used as therapeutic-Pilates to rehabilitate our shoulders. It promotes LA and SA activity, too. Since push-ups targets many parts of the body, the shoulder is one of them that benefits the most. In this type of exercise, most of the force is concentrated on the shoulder. This is why those people who regularly do push-ups are the ones who have a more developed shoulder. On the other hand, push-ups is an exercise that improves stamina. It works similarly with jogging and swimming. Apparently, heart is the one working the most in this exercise. Because of this, oxygen supply is distributed well to parts that are mostly involved such as the shoulder. Therefore, push-ups are commonly used to rehab scapula in Pilates. To do this, make sure feet, legs, and body are straight. The only parts that should move are your arms. With your arms, push the floor quickly and with force. Don’t prolong the push in the middle as your weight will increase and ruin the process. And if you think, you are in your last push, stop from there so it may not hurt your back. Push up plus is an exercise that many people don’t know. However, this exercise is one of the most effective methods that are very good for shoulders and serratus anterior. This is also a proven way to treat many scapular problems. On top of that, it further strengthens all such parts as this exercise is specifically designed to target those areas. If your objective is to treat or strengthen your shoulder, serratus anterior, and scapula, this is the perfect method you can apply. You may wonder how it’s different from the traditional push-ups. There is no difference in position except in the movement. In the traditional push-ups, the only parts that move are your arms. In push up plus, your shoulder and back are the ones that move. Your arms are straight as well as your feet, legs, and body. To perform push up plus, all you have to do is to push your back toward the ceiling. The center of your back should go up while both sides of your shoulder go down, and vice versa. What is good about this type of push-ups is that it does not give so much stress on your whole body. It targets only the parts that move. There are a lot of rehabilitation programs that are said to rehab scapula in Pilates. For some, they work well. For others, there are different stories. Nevertheless, the above methods are proven and are commonly used in therapeutic Pilates. You can try the above exercises. But if you need more guidance, it is best to get the help of a Pilate’s instructor.